Roll out pizza dough very thin (mine was cold from storing in the fridge overnight and it was fine) and spread a very thin layer of butter all over. 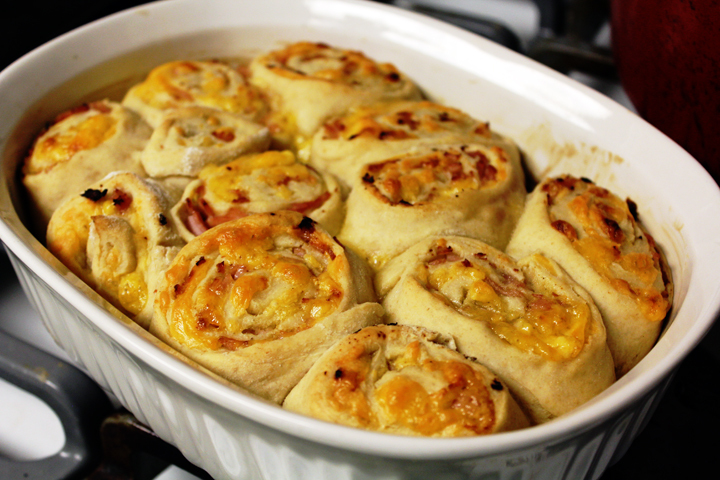 Sprinkle cheese and ham over the entire dough and roll it up tight. Slice the roll into 1 1/2 inch slices and arrange in a buttered baking dish. Let the rolls rest and puff up for about 15 minutes and then bake for about 25 minutes, or until browned and cooked through.